Here, the news for our Filipina Boxing champ Ana "Hurricane" Julaton who recently fight against Yesica Marcos of Argentina. The Julaton vs Marcos fight was held on Mendoza, Argentina. This fight results was never been the same on the last history fight between Lazarte vs Casimero fight who ended a bloody brawl fight between the Argentinian boxing fans and the ring, thta poured damaged chairs after the fight. There was added more security of the fight between Julaton vs Marcos. The fight result, Anna Julaton lost her WBO Women’s Super Bantamweight Title by challenger Yesica Marcos in a unanimous ten rounds decision in front of the 27,000 strong Argentinian fans. 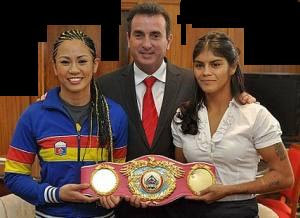 Marcos won over Julaton and now capturing the belt from Julaton where the scores, Judge Jose Roberto Torress (98-91), Judge Ignacio Robles (96-92) and Judge Cesar Ramos (98-92) all way win for Yesica Marcos crowned as the new WBO Women’s Super Bantamweight Champion of the world. The Full video replay of Julaton vs Marcos will be available in a few hours or day delayed if there's available fight replay on this fight. Check back later. Boxing fights against the girls to girls.